Configure Bamboo to use Instant Messaging (see below). Configure a plan to send IM notifications about its build results (see Configuring notifications for a plan and its jobs). 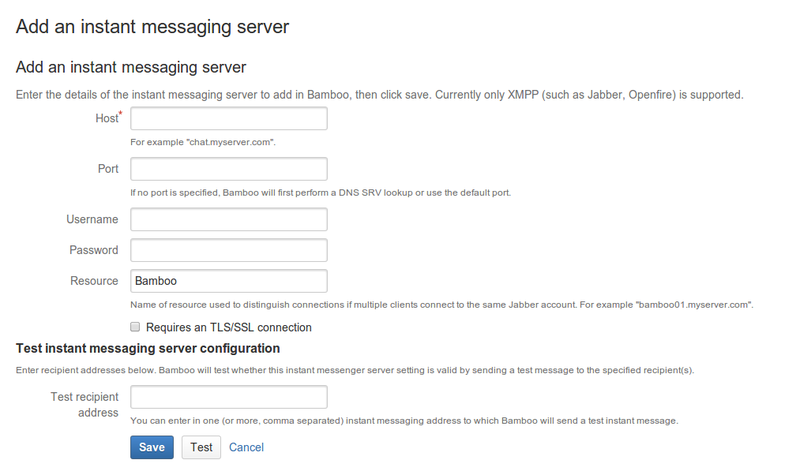 Please note, Bamboo supports XMPP protocol for messaging. This means Bamboo can be used with Gtalk or your enterprise XMPP server. Click IM Server in the left navigation panel (under 'Communication'). ホスト The address of your IM server (for example, 'chat.atlassian.com'). ポート The TCP port that your organization uses for IM traffic (or leave this field blank to have Bamboo either perform a DNS lookup or use the default port). ユーザ名 The login name of the IM account from which Bamboo notifications will be sent. Change password Select this if you have specified a username different from the currently logged-in user. リソース An identifying name for the connection if multiple clients use the same jabber account. Requires a TLS/SSL connection Select this if your IM server uses SSL.